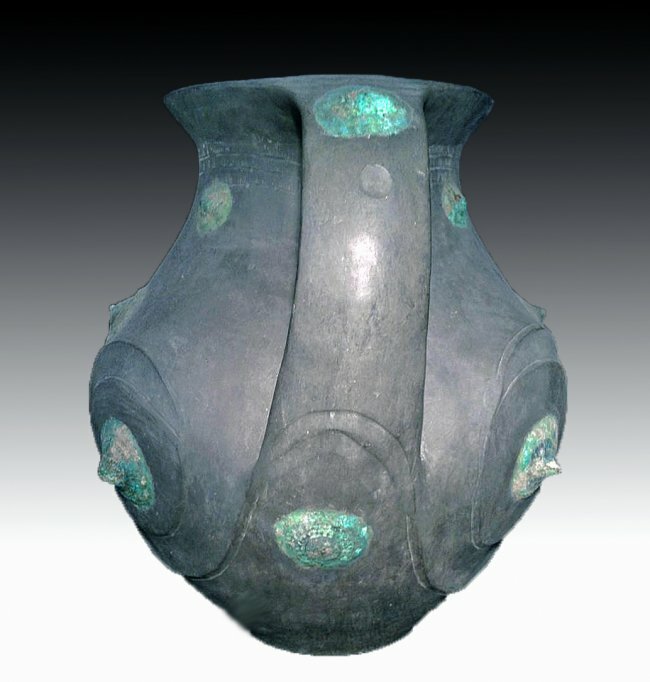 Burnished Amphora with Bronze Fittings, China, Late Warring States Period-early Han Dynasty, 476-221 BCE. Estimate $12,000 – $15,000. Photo Artemis Gallery. This boldly modeled and very large ovoid shaped amphora is embellished with unusual bronze appliques. 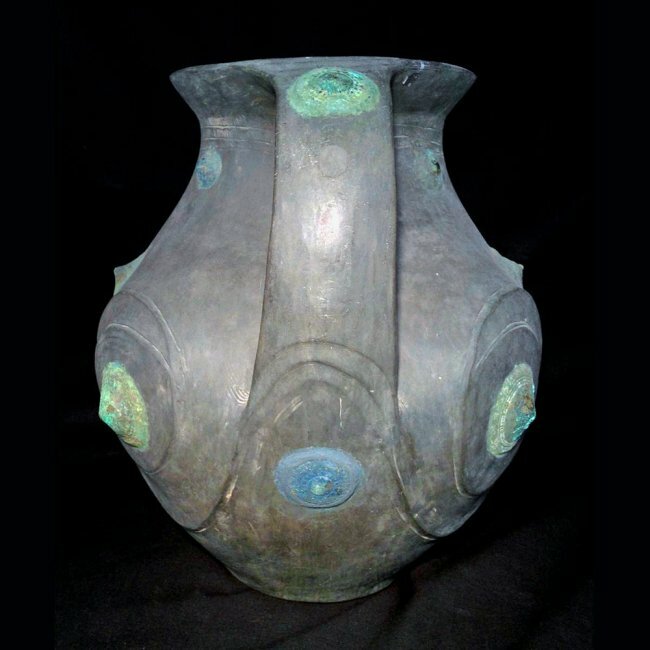 This wonderful modernistic shape which mixes well with modern art is a bit of a mystery since usually Chinese art forms are repeated dynasty after dynasty. This shape was only used during the Late Warring States period through early Han Dynasty. Some theorists suggest import by foreign peoples, but the only comparable shape is a bronze version of much later date from Japan. It is a spectacular piece if displayed on a pedestal. We can help the buyer find an appropriate pedestal for its enhancement. Wide strap handles. Flared neck has 3 linear bands around exterior and concentric circular combed bands on interior of neck. Bottom has cross hatching. Size: 12-1/4″H. Provenance: Acquired by present owner from an old New York collection. 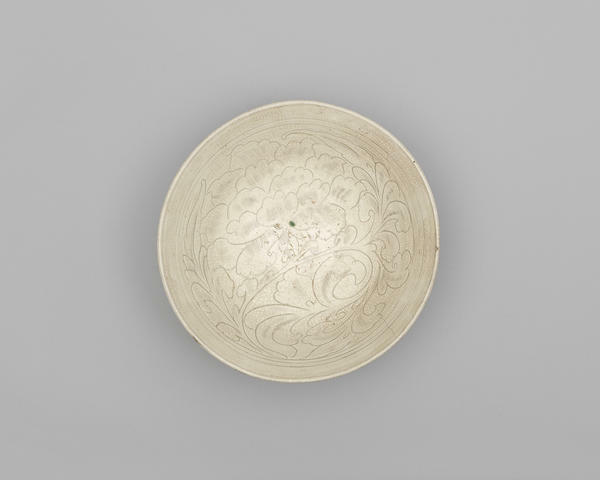 A Cizhou-type deep bowl, Song-Ming Dynasty. Estimate £800 – 1,200 (€1,100 – 1,600). Photo Bonhams. Carved to the interior with a large stylised flowerhead and scrolling leafy stems, beneath a triple banded border, a small splash of green glaze to the centre, the cream crackled glaze falling short of the foot to the exterior. 31cm (12.1/4in) diam. 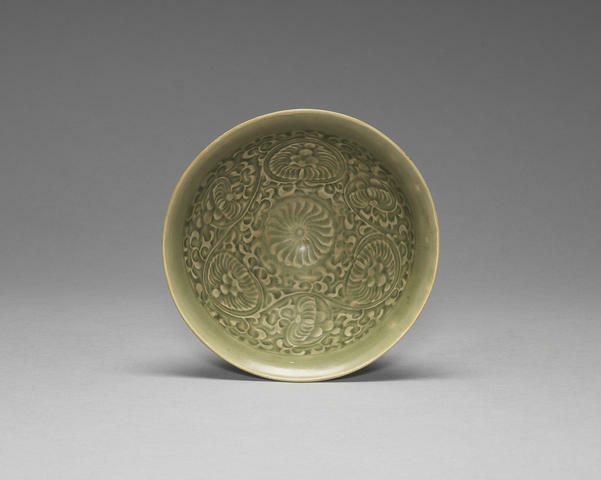 A small Dingyao foliate dish, Northern Song Dynasty. Estimate £2,000 – 3,000 (€2,700 – 4,000). Photo Bonhams. 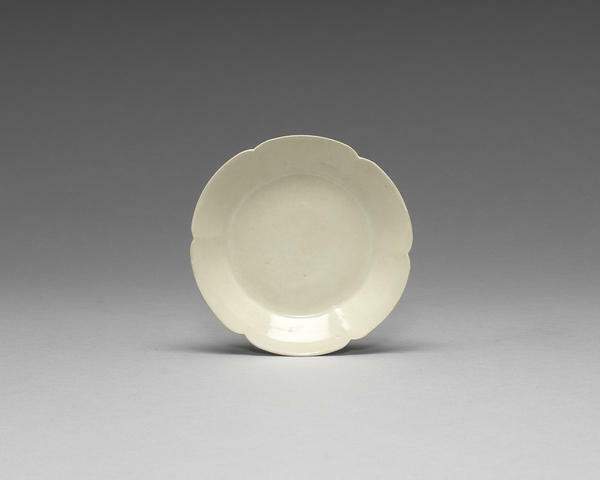 The small dish with six moulded lobes, the foliate rim unglazed, all covered in a lustrous ivory hued glaze, box. 10.3cm (in) diam. (2). 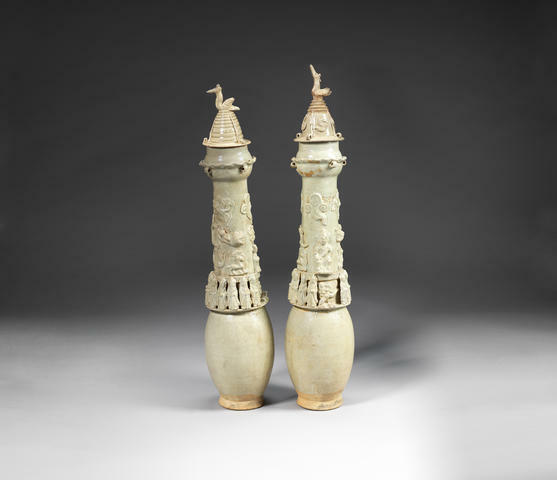 Two qingbai cup stands, Song Dynasty. Estimate £800 – 1,200 (€1,100 – 1,600). Photo Bonhams. Each set on a tapering foot, with dish form tray supporting a central raised inverted cup-form stand, the glaze of pale creamy blue tone. 12.5cm (4.7/8in) diam max. 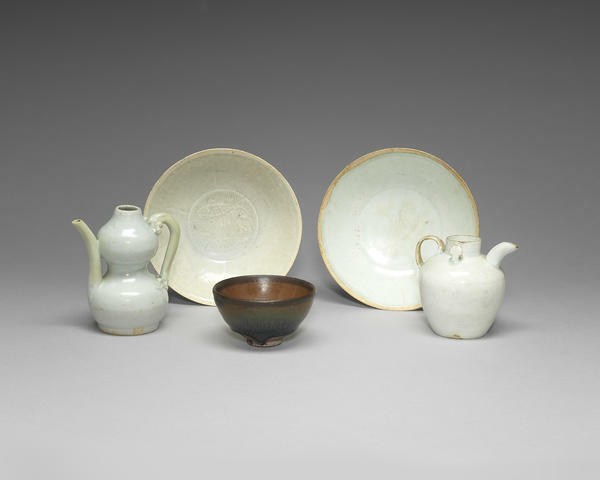 Four qingbai-glazed wares and a Jian tea bowl, Song to Yuan Dynasty. Estimate £1,000 – 1,500 (€1,300 – 2,000). Photo Bonhams. Comprising: a qingbai double-gourd ewer with chilong-form handle; another qingbai ewer with foliate lugs; a qingbai dish incised to the exterior with foliate motifs; a qingbai-type glazed dish with impressed fish motif; together with a small ‘hare’s fur’ tea bowl. 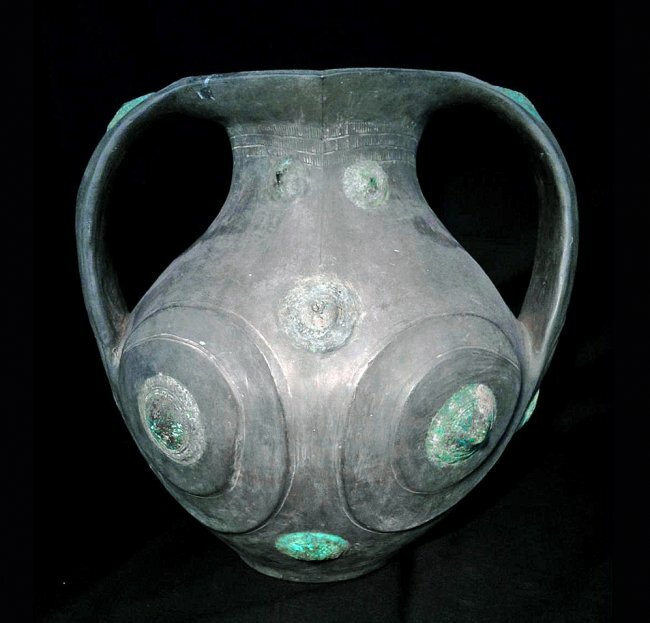 The double-gourd ewer: 11.5cm (4 1/2in) high (5). 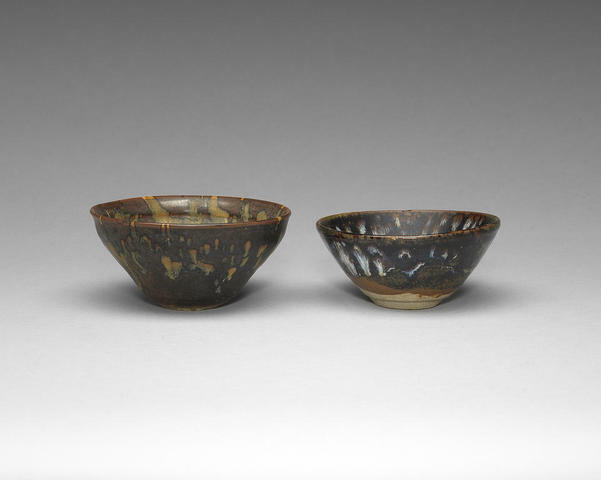 Two Jizhou ‘tortoiseshell’ glazed bowls, Southern Song, 12th-13th century. Estimate £2,000 – 3,000 (€2,700 – 4,000). Photo Bonhams. Each decorated with variegated splashes to the interior and exterior on mottled russet and brown glazed grounds, variously falling short of the foot and lower body to reveal the buff pottery. The largest 12.2cm (4.7/8in) diam. 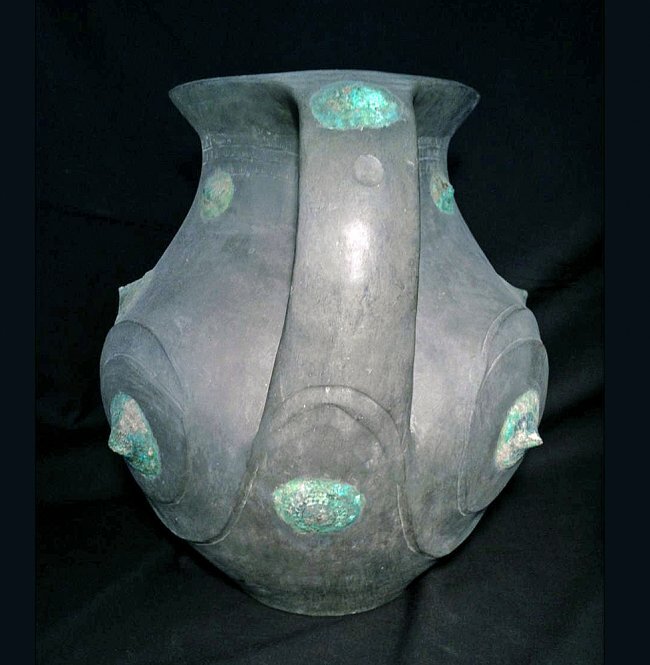 A Yaozhou-type conical bowl, Song Dynasty. Estimate £1,000 – 1,500 (€1,300 – 2,000). Photo Bonhams. Moulded to the interior with stylised scrolling chrysanthemum on a dense foliage ground, around a central flower head, the exterior with carved vertical ribs, covered overall in a glassy, olive green glaze pooling in the crevices to highlight the design, fitted box. 12.5cm (5in) diam. 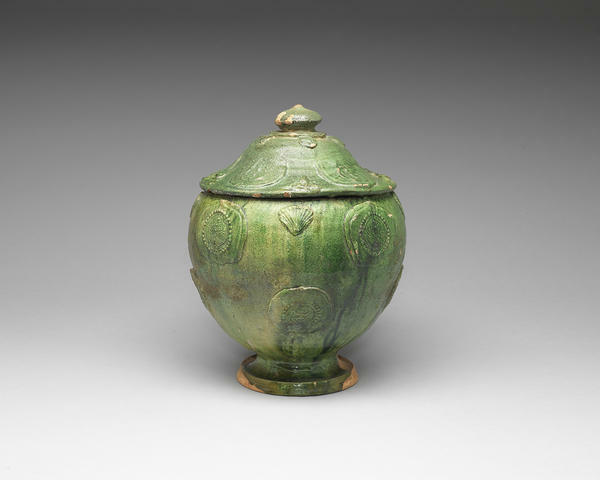 A green-glazed Buddhist funerary jar and cover, Song to Yuan Dynasty. Estimate £500 – 700 (€660 – 930). Photo Bonhams. The globular earthenware body raised on a short stem foot, with applied Buddhist motif and shell moulded panels, the lid similarly decorated, all covered in a green lead glaze. 34cm (13 3/8in) high (2). 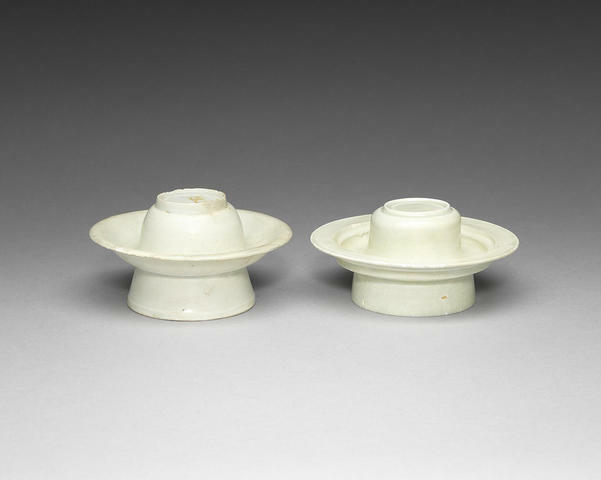 A pair of pale green glazed funerary jars and covers, Song-Yuan period. Estimate £700 – 1,200 (€930 – 1,600). Photo Bonhams. With oviform bodies supporting tubular tapering necks, the shoulders and necks with applied carved decoration including a row of Star Gods and Daoist figures, all beneath a seated guardian beside deer and phoenix, with the Green Dragon of the East on one jar and the White Tiger of the West on the other, the bulbous mouth with an applied wavy border and four small loop handles, the covers with crane finial and carved and applied decoration, covered overall in a light green glaze. The tallest: 825cm (32 1/2in) high (4). Note: Accompanied by a letter by Rose Kerr, when curator of the Far Eastern collection at the Victoria and Albert Museum, dated 1994. 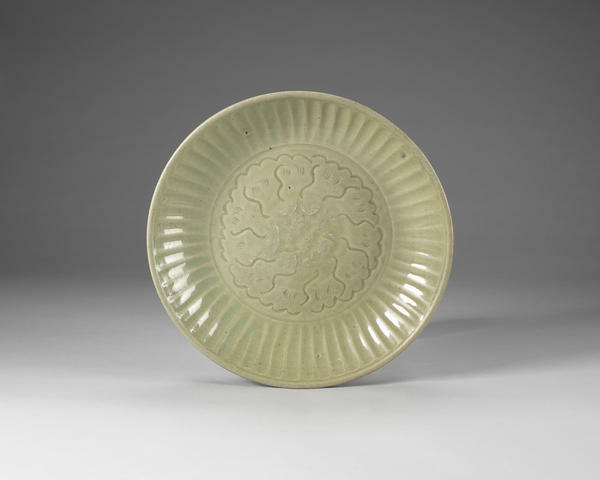 A Longquan celadon dish, Ming Dynasty. Estimate £800 – 1,200 (€1,100 – 1,600). Photo Bonhams. The heavily potted dish incised and moulded to the well with foliate motifs, the side with radiating flutes, all covered in a thick bean-green glaze, the base with an unglazed firing ring oxidised to a reddish-orange colour. 33cm (13in) diam.